This is a great live version of "New York State of Mind" during a rehearsal in Russia in 1987. It was not on 1987's Kohuept, but was on the 1991 documentary video (VHS) "A Matter of Trust." 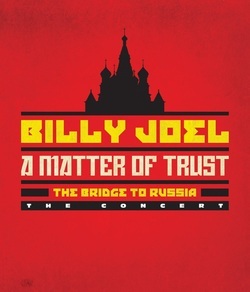 Sony released it (audio and video) on 2014's "A Matter of Trust: The Bridge to Russia." Good thing, this is an impassioned live version. Billy improvises some lyrics and Mark Rivera does a fantastic job on the alto sax. Download "New York State of Mind (Live-Russia)"
An instant classic. There has never been a better song written about New York, not "New York, New York," "Mona Lisas and Mad Hatters," or "Empire State of Mind." Billy hits all the right notes in this tribute to the city he knows and loves. The song was written right after Billy's return to New York after a three tiring years breaking into the L.A. music industry. Overcome with emotion and pride upon his return, he said that the music and lyrics to New York State of Mind just came pouring out one day on the bus ride into New York. He'd been to Hollywood, he'd been up in the Evergreens, but home is a ride on the Hudson River line. In an interview with Mark Seal in American Way magazine, Billy said "'I'm a New Yorker, and it's indelibly imprinted on my soul that this is where I'm from and where I should be.' When he got home he ran straight to the piano and within 30 minutes had written New York State of Mind, which he calls 'a celebration of a homecoming.'" Billy clearly missed the sights and sounds of the Big Apple, and he never left again. Billy cleverly contrasts his experiences elsewhere (the Rockies, Miami Beach, Hollywood) which cannot compare to the grittiness and beauty of New York. Reality is New York, taking a bus on the Hudson River Line, hanging out in Chinatown or Riverside. Anything else is being out of touch with reality, with highbrow of The New York Times and lowbrow of the Daily News. The song has been covered by many people (e.g., Barbara Streisand, Shirley Bassey, Mel Torme, Oleta Adams, Melissa Etheridge, Alicia Keys, and Billy's duet with Tony Bennett) and Billy has made several live recorded versions, but I still like the earnest original. * The sax solo by Richie Cannata on the original LP version is still the best in my opinion. * But here is a great acoustic guitar cover of the song from a Keri Prather. And this is an interesting cover by Max Schneider & Phony Ppl. Live version from 1987 Russia concerts on 2014's A Matter of Trust. Live version from Grammy Awards held in New York in 1988 with David Sanborn on saxophone.